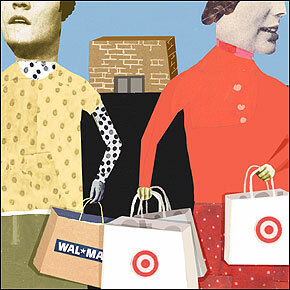 So what's the big difference between Target and Wal-Mart? We welcome one to a prime corner of Downtown Crossing but cold-shoulder the other. As soon as rumors floated that Federated Department Stores would be shuttering Filene's in Downtown Crossing, dismayed Boston officials started thinking about who next would occupy the magnificent 1912 Beaux-Arts building. Two names quickly surfaced: Wal-Mart and Target. This summer, Wal-Mart signaled it might be interested. The reaction was swift and negative. At a Labor Day breakfast, politicians ranging from the mayor to city councilors to members of Congress vowed to thwart the company. Rich Rogers, executive secretary-treasurer of the Greater Boston Labor Council, told the Globe at the time that the 90,000-member group would "do everything in its power to stop Wal-Mart from moving into Downtown Crossing." Wal-Mart backed off. And Target? Then and now, "people are thrilled with Target," says Randi Lathrop, the Boston Redevelopment Authority's deputy director of community planning. Community groups organize against Wal-Mart, bloggers rail against it, and major unions - including the nation's two top teachers unions - have urged consumers to boycott it. The Arkansas-based chain, the nation's largest retailer, is routinely vilified for destroying mom-and-pop businesses, underpaying employees, resisting efforts to unionize, and selling foreign-made goods. Target, on the other hand, seems beloved. It's an anomaly that puzzles many - Target, they argue, also undermines local businesses, shuns unions, squeezes employees and suppliers, and buys from overseas. "For some reason, the same stigma doesn't attach to Target," says Suzanne Mulvee, a real estate economist with Boston-based Property & Portfolio Research. A case in point is the Washington, D.C.-based Wal-Mart Watch, one of numerous anti-Wal-Mart groups. Spokesman Nu Wexler acknowledges Target's business practices differ little from those of Wal-Mart, but when asked why there is no Target Watch, he has no ready answer. "Wal-Mart," he lamely offers up, "is the bigger target." Let us review the stereotypes. Wal-Mart evokes conservative red state; Target, liberal blue state. Wal-Mart is overalls, guns, and purged lyrics; Target is high thread counts, "Tar-zhay," and Michael Graves designs. Wal-Mart is for people who can't afford full retail; Target is for those who can, but would just as soon pay less. Reality is less simple. In June, for instance, Black Enterprise magazine named Wal-Mart one of the 30 best companies for diversity. Wal-Mart, founded in 1962 by Sam Walton, was based on a simple business proposition: low prices for the masses. The idea propelled the company to sales of $285.2 billion last year. Target, meanwhile, was the outgrowth of the Minneapolis-based Dayton department stores, and its first location also opened in 1962. To compete against the fast-growing Wal-Mart, however, price wasn't enough. So Target went after customers Wal-Mart ignored - the middle and even the upper class. And to get them to walk in the door, it gave them something Wal-Mart didn't have: style. The way that difference has evolved explains why so many demonize Wal-Mart and praise Target. Target fits the culture and politics of the land of Kerry and Kennedy, making its business strategy - at least for the Northeast - perhaps more brilliant than its founders ever realized. Not only does its mix of price and cachet attract customers, it also keeps the opposition at bay. Foolishly so, of course - low wages and meager benefits should be equally objectionable whatever an employer's cultural hues. And it leads to strange sorts of political blindness. Wal-Mart, for example, isn't to blame for the much-lamented collapse of full-price retailers such as Filene's and Jordan Marsh. Its customers were never theirs to begin with. Target is a different story, however. By making discount shopping acceptable to the fashionistas, Target made obsolete the traditional department store. Should the firm eventually settle in Filene's old downtown digs, ironically enough, it will be not unlike the fox who ate the chickens and then moved into their coop. Thomas Keane is a partner in a private equity fund and former Boston city councilor. E-mail him at tomkeane@tomkeane.com.